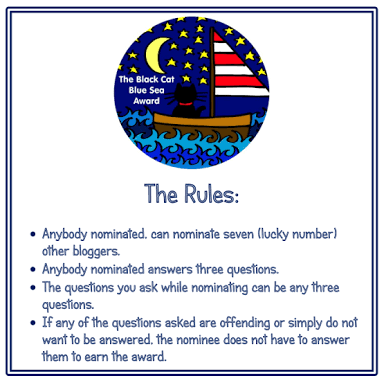 This is an award given and received by fellow bloggers and is meant to be fun. If any nominees are not interested in participating you don’t have to, I wont be offended. 1 What has blogging done for you as a writer? Blogging has given me focus and the drive to write every day. Before I started my blog I wrote only when I thought I had an idea. Now I push myself a little harder – not forced, just a gentle nudge. 2 What are your 5 top favorite movies and or books? 3 What/who inspires you to write? Inspiration is sometimes a personal thing but I do have a few friends who supported me as I began my journey as a writer. They were my cheerleaders when I wanted to quit. When I get stuck I always think of them. 2) What do you do when you need to unplug and relax? 3) Name 3 people you admire and one of the qualities you admire in them. Thank you Sheryl for this award. It was very fun! !